Have you ever heard about lomography? If you haven't heard before, it's time to educate yourself. Whether you are a professional photographer or a self-confessed newbie, because everyone can be a lomographer. It began with a fateful encounter in the early 1990s, when two students in Vienna, Austria, stumbled upon the Lomo Kompakt Automat - a small, enigmatic Russian camera. Mindlessly taking shots from the hip, and sometimes looking through the viewfinder, they were astounded with the mindblowing photos that it produced - the colours were vibrant, with deep saturation and vignettes that framed the shot - it was nothing like they had seen before. Upon returning home, friends wanted their own Lomo LC-A, igniting a new style of artistic experimental photography that we know as lomography. These rules define Lomography's philosophy and approach towards photography. Recite them, or break all the rules – whichever way, be ready to throw all your inhibitions about photography to the wind! And yes, here I am. I want a kind of the newest lomo camera, La Sardina camera. I am so in love with La Sardina - Bettle Starr camera. Oh, God I want this camera so much. Unfortunately it is not available yet in my country. What has already available at Lomo Embassy in Indonesia is La Sardina made from plastic. I want La Sardina camera made from Metal. I want Lomo La Sardina - Bettle Starr camera so bad!!! love the outfit sis, looks comfortable and fab on you. @queenie: yeaayyy! thank you girl! Thank for the tips. Seems like you love classic look cameras or this one is more special than Canons that it makes you head over heels? Not sure, but I love its look too. Btw, you've got model shape! 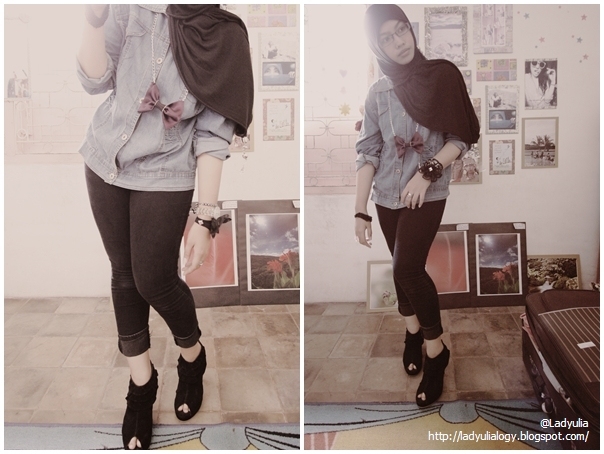 I just fall in love with thoose shoes hehe,,much lovee!